The horse tail should be relaxed after you have played. Do that by turning the screw at the frog end of the bow. Don't touch the string part between the bridge and the fingerboard. This will put finger grease and make it difficult to play. 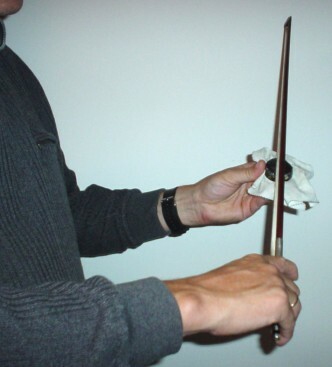 You should regularly (at least once a week if you are practicing daily) grease your bow with rosin. 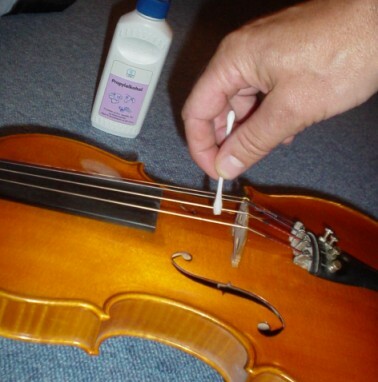 Make sure that you apply rosin all over the bow, by moving the rosin several times forward and back. The violin "works" because the bow is gripping into the string. Without rosin on the horse hair, the violin will not say anything. Do not touch the horse hair of the bow. If the bow becomes greasy it will not make any sound! Get the resin off the string using propylic alcohol.